Even though borscht was the first way I ever ate beets (at a pretty awesome tasting dinner at evoo a few years back), I hadn’t made it until recently. I have no real excuse for this other than having no personal vision of borscht that would allow me to sort through the hundreds of different recipes available and select one. But this winter, that problem was solved for me by necessity: given an overwhelming beet situation, I just picked one on the basis of “having all of the basic ingredients in my kitchen at the time.” Very scientific. The best thing about the soup below is that it is both fast and easy, rare qualities in a soup. It took me a bit over an hour, start to finish, including peeling and chopping the vegetables. 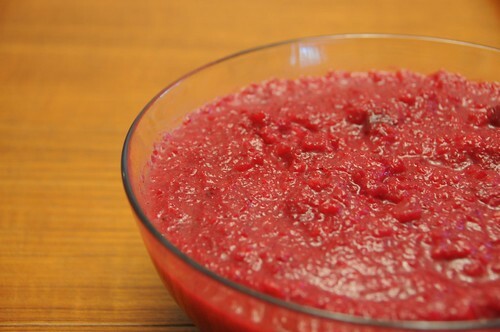 You can also serve it pureed (as shown above) or not, depending on your preference. And for something made with vegetables in season at the dead of winter, it is surprisingly light and fresh, more like a vegetable soup than like a stew. Combined with its brilliant hue, it makes for a nice break from the beige diet of late winter. Peel and dice the onions. 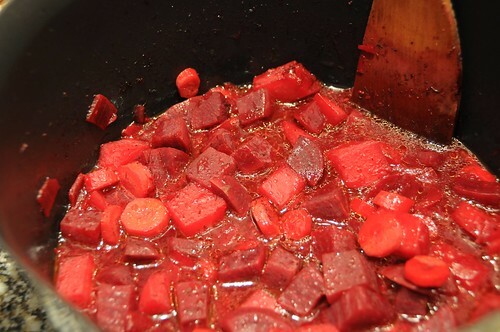 Then do the same to the carrots, beets, and potatoes, aiming for half-inch chunks. Heat the olive oil in a big stock pot over medium heat. Add the onions and cook until softened and translucent, about five minutes. Add the garlic and dill, stir, and cook for another minute or two until fragrant. 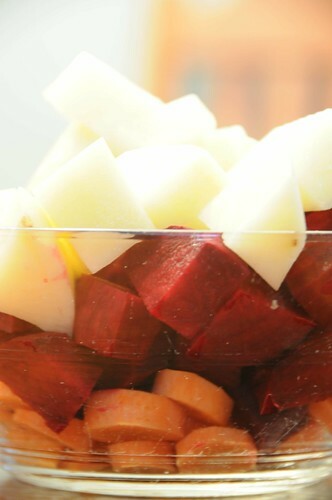 Then add the carrots, beets, and potatoes. Cook for another five minutes, until the vegetables start to lose their crispness. Add the salt, lemon juice, sugar, and vinegar, plus four cups of water. Mix well, and turn up the heat so it boils. Then reduce the heat to a simmer, and cook until all the vegetables are tender. Start checking for this around 30 minutes, but it could take up to 50 minutes, depending on the size of the pieces. If you want to serve it as a chunky soup, you can go ahead serve it as soon as it is cooked. If you want to puree, you’ll probably need to remove it from the heat and wait for it to stop boiling, then do it in batches in your blender or food processor. (It’s a bit much for an immersion blender, I’m afraid.) If you find the texture too thick after pureeing, you can add more water. Many people like this with sour cream, although I preferred it plain. Makes about six cups.